Each Canine Friends Pet Therapy owner and dog team is assigned a rest home, hospital ward or hospice which they visit regularly to an agreed timetable.​ ​The location assigned will be determined by the owner's availability and interest and the dog's personality. ​Visits last around an hour, plus any traveling time. This can vary depending on things like the weather. Some dogs wilt quite quickly in hospital heat! ​Members visit one or two locations on a regular basis, usually weekly or fortnightly. 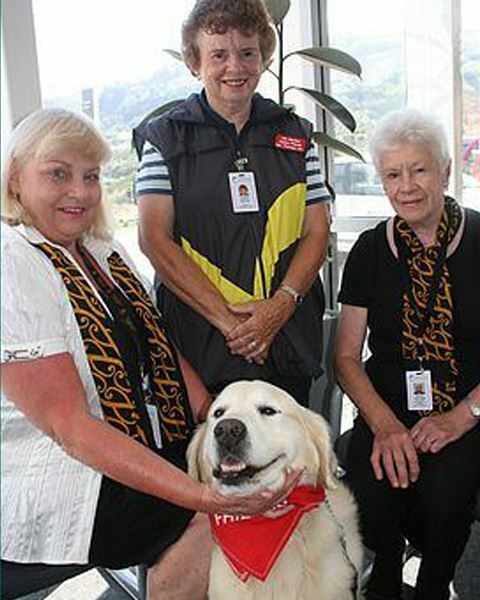 ​Visits are scheduled to suit hospitals and rest home programmes and members' commitments and availability. Weekend visits have become increasingly popular as fewer people have free time during the week. Dogs can be any size shape or combination! ​What matters is temperament and behaviour. Dogs who really like people and are quite calm are very successful at this work. We look for dogs that are friendly, gentle, quite placid, not too boisterous, dogs who like to be patted, talked to and have their ears scratched! Please note: Canine Friends Pet Therapy does not select breeds that are listed as "banned" under the NZ Dog Control Act 1996, i.e. American Pit Bull terrier type dogs, Dogo Argentino, Brazilian Fila and the Japanese Tosa breeds. We also do not select cross-breeds of these breeds. share your interest in dogs with other like minded people. enjoy seeing people come to life as they enjoy touching and talking to your dog. enjoy the reminiscences and stories that your dog brings out of the people visited. share your skills and talents with a worthwhile organisation. contribute stories and photos to our website and newsletter.